Developed in response to requests of audiences who want more puppet mastery demonstrated in other shows, Peter Hart delivers another fascinating show of puppetry skills with a new production "The International Show". The performance employs unique puppets from different cultures to give insight into the world of puppetry, broaden world-view, and expand appreciation of the arts. This show debuted in 2002 with a successful run in libraries and schools throughout Georgia. The word "deliver" serves as a key concept for the performance as Peter Hart takes on the role of a UPS - style delivery man and rolls in packing crates of different sizes for the show. The premise is your library has just received a puppet shipment from far off lands and, together, Mr. Hart and the audience will discover the contents of each crate as they are quickly unpacked for the first time on stage. A snake charmer marionette from India that includes audience interaction! A singing knight & horse from Italy with one of the most beautiful songs your audience has ever heard! 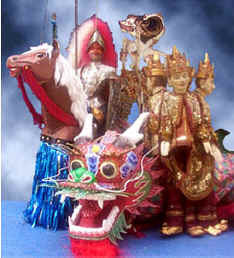 Authentic shadow puppets from Bali in a demonstration of construction materials & presentation style used. A dancing Chinese parade dragon that enlist members of the audience in its manipulation! Performance area requirements in diagram fashion. You provide the space, we bring everything else!